Lock in a great price for Village Hotel Katong by Far East Hospitality – rated 8.6 by recent guests! Rooms were fine, shower was fine, balcony was nice. Flexible with checkout time. Near to a place with great Laksa (there are two so make sure you go to the right one). Near to the airport. Concierge was really nice and helpful with bags. Airport shuttle. Rooms were clean and close to public transport. Close to shopping centre and restaurants. Breakfast was good. One of the best hotels l have experienced. Everything was perfect: location, staff, room, amenities, food, etc. Wish l could stay there forever. Would not stay anywhere else in Singapore. The location suited our needs and the staff are very friendly and welcoming. The bed was very comfortable. Good flat screen TV and free superfast wi-fi. Great Location on Lovely street with great restaurants. Supermarket downstairs is a great help. Close to airport. Management upgraded our room (see negative comments). The room was modern, clean and comfortable. Staff was friendly. We would stay here again for the right price now that we understand the property, location, etc. Attached to a mall. Very convenient! Great price. Super comfy beds, good black out curtains, nice bathtub. There was a bus stop near by to head downtown. And plenty of option to eat right in the same building as the hotel. Village Hotel Katong by Far East Hospitality This rating is a reflection of how the property compares to the industry standard when it comes to price, facilities and services available. It's based on a self-evaluation by the property. Use this rating to help choose your stay! 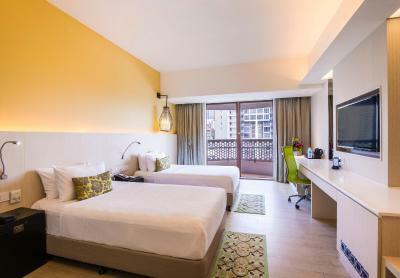 One of our top picks in Singapore.Set in Singapore, 1 milesss from One KM Mall, Village Hotel Katong by Far East Hospitality has a number of amenities, including a fitness center, a restaurant and free WiFi. Attractively located in the Katong district, the property is situated 1 mile from Geylang Serai Market and a 19-minute walk from City Plaza. The accommodation provides free shuttle service, and currency exchange for guests. The rooms have air conditioning, a TV with cable channels, a kettle, a shower, free toiletries and a wardrobe. Every room is equipped with a private bathroom. The hotel offers an outdoor pool. Languages spoken at the 24-hour front desk include English and Malay. Tanjong Katong Complex is 1 mile from Village Hotel Katong. Katong is a great choice for travelers interested in culturally diverse food, food and tourist attractions. When would you like to stay at Village Hotel Katong by Far East Hospitality? The air-conditioned rooms come with cable TV, a safety deposit box, and tea/coffee making facilities. Each room has a private bathroom with toiletries and a hairdryer. Public parking is available on site (reservation is not needed) and charges may apply. Located on levels 9 to 12, the air-conditioned rooms offers views of Kallang district and come with cable TV, a safety deposit box, and tea/coffee making facilities. Each room has a private bathroom with toiletries and a hairdryer. Please note that children below 12 years of age are not allowed in the club lounge. Located on the 7th to 12th floor, this room features Peranakan-style furnishings, a private balcony and faciities like a 46-inch LED TV. Each room has a private bathroom equipped with toiletries and a hairdryer. This double room has a balcony, air conditioning and a mini-bar. It is fitted with Peranakan-style furnishings and provides modern amenities like a comfortable couch, a 46-inch LED TV, complimentary internet access and s bathroom equipped with rain shower facilities and an in-room bathtub. Includes privileges like access to the Peranakan Lounge for daily breakfast and evening cocktails in a comfortable environment. This air-conditioned room is fitted with a cable TV, a safety deposit box, and tea/coffee making facilities. Each room has a private bathroom with toiletries and a hairdryer. Guests enjoy complimentary access to the Club Lounge. Please note that breakfast rates for children are subject to additional charges. The new Village Hotel Katong-the flagship Village hotel, reflects the strong Peranakan heritage of the surrounding Joo Chiat and Katong district in Singapore. 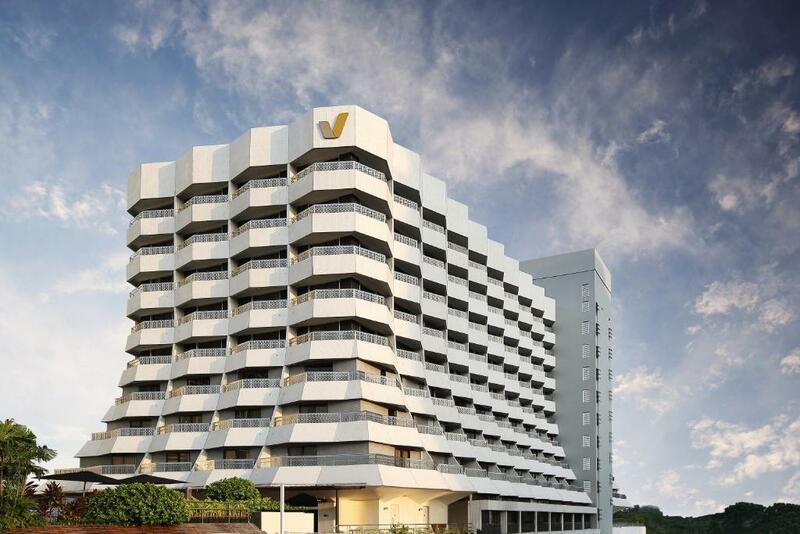 Village Hotel Katong is also one of the few hotels located in the eastern region of Singapore, which is within 10-minute drive to the Singapore Expo and 15-minute drive to the Changi International Airport, Central Business District and Orchard Road shopping belt. It is also within 5-minute walk to the Parkway Parade Shopping Mall and 10-minute walk to the East Coast Park. This smoke-free 229-room hotel provides great value for both business and leisure travellers. Other hotel amenities include complimentary Wi-Fi access, complimentary airport shuttle service, cable TV, mini bar, swimming pool and gymnasium. Guests can also look forward to a new dining concept-Katong Kitchen at Level 4 and a new retail attraction-Katong V.
Hotel surroundings – This neighborhood is a great choice for travelers interested in culturally diverse food, food and tourist attractions – Check location Great location - show map Guests loved walking around the neighborhood! House Rules Village Hotel Katong by Far East Hospitality takes special requests – add in the next step! One older child or adult is charged SGD 70.62 per person per night in an extra bed. Village Hotel Katong by Far East Hospitality accepts these cards and reserves the right to temporarily hold an amount prior to arrival. Please note that parking lots are subject to availability. The hotel offers a complimentary airport shuttle service to and from Changi International Airport Terminals 1, 2 and 3. Please contact the property directly for a copy of shuttle service schedules using details from the Booking Confirmation. Seats are subject to availability on first come first serve basis. Guests are required to approach the Ground Transport Desk in the arrival halls of their respective terminal for assistance. For guest departing Village Hotel Katong, please register at the the hotel concierge. For group bookings of more than 5 rooms, a deposit of one-night room rate (including tax) for each booking is required upon reservation made. This is applicable to both Flexible and Refundable Policy. Please note that deposit is nonrefundable. Please present the same credit card used to guarantee your booking upon check-in or making payment at the hotel. An alternative credit card will be asked if the credit card used to guarantee the booking is not presented. Hotel staffs professionalism and helping attitude, cleanliness, huge grocery shop at downstairs very convenient, bed and pillow and overall room amenities good standard and comfortable. Didn't have the time to turn on the TV so couldn't tell about the available movie and English channels ...! No comment, front desk need to be fair, sometimes i felt they treat customer different. . Must serve all customer the same. Very comfy, clean, location n spacious room. The hotel did not have available the king size bed requested when booking, however the two sperate beds were very big and comfortable. I like the location (close to bus stops and restaurants, bar, pubs), the convenience of having a supermarket in the same building and the swimming pool. The quarter is very nice and close to East Coast Park. Too few choices of food for room service menu. Front Office staff was most polite, knowledgeable & helpful. Main credit goes to Melvin. He does his work most attentively with a smile. Comfortable beds, good range at breakfast and great with supermarket underneath the hotel. Kids loved the pool and good to have shuttle bus to airport. That I had to take either public transport or taxi in order for me to go to the attractions I thought it was just near. It is clean and staff is easy to talk to. This is a very old hotel inside some small shopping mall. The interior and everything is super outdated and not functional, old carpets with special distinct smell. It was okay to stay one night, but overall would not recommend for that money. Location is okay, close to the bus stop and the airport.